Visiting County Clare is a multi-sensory, hot and cold Irish experience. Firstly you have the wild, windswept beauty of the landscape and the desolate, dramatically pounding Atlantic coastline. Then you've the wonderful warmth of traditional Irish music, which doesn't just live on in County Clare, it flourishes in hundreds of different venues. There is a wide range of accommodation on offer and the best places to stay vary from bijou B&Bs to country house hotels. Ennis is the regional capital, and a good place to stay to hear a lot of music - but then so is the smaller village of Doolin, unofficial world capital of Irish folk music! If you stay, or pass through Ennis, you might want to visit the famous friary. County Clare is home of the spectacular Cliffs of Moher, on the edge of the strange, rocky landscape of the Burren. Despite the fact that nothing but grasses grow on this vast limestone sheet, the Burren has been inhabited since the building of the Pyramids. Some of Ireland's oldest monuments and archaeological treasure can be found here, including the Caherconnell stone ring fort and Poulnabrone Dolmen, a five and a half thousand year old burial chamber. As well as being windswept and interesting, and musical and welcoming, Clare is also is a much appreciated backdrop for outdoor pursuits. In addition to all the walking and biking routes, there's golf courses, surfing, diving, kayaking, sailing, horse riding and both freshwater and saltwater fishing. Visit historic Bunratty and Knappogue Castles, the latter of which holds regular medieval banquets - a memorable experience! The 15th century Quin Abbey is a highly atmospheric spot and definitely worth the stop. Take the whole family to the reconstructed Bronze Age village by Craggaunowen castle, which is built in a typical ringfort style, complete with crannogs. The castle is also worth a look. If you're from around these parts, but a long time back, you'll want to be head to Corofin as this is where you'll find the Clare Heritage and Genealogical Research Centre. Hike around the scenic Cliffs of Moher at sunset and marvel at the breathtaking views. Our pick of the best places to stay in County Clare are located near the Atlantic Coast, so all make great bases for exploring this wild and beautiful region. Gregans Castle Hotel is the perfect place to stay if you're trying to finish a book - remote, peaceful, beautiful and historic. CS Lewis, JRR Tolkien and Seamus Heaney have all stayed here and enjoyed the serenity. Though it might not have had the same 3 AA Rosettes then, it would still have been a great country escape for birdwatching and long walks. 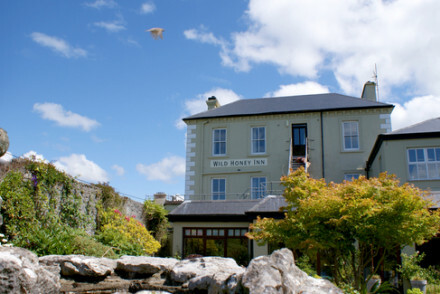 If you're here for the great outdoors, then the Wild Honey Inn in the Burren is one of the best places to stay in County Clare. This great little country inn is close to two great surf beaches, a golf course and plenty of walking and biking trails. Apparently the food is excellent, and the garden charming. Sheedy's is a top coastal getaway, set in an 18th century country house offering traditional accommodation and a library. Enjoy splendid cuisine, with an emphasis on local seafood, and spend your days cycling, hiking, playing golf or surfing. County Clare is never exactly balmy, the highest the temperature goes is an average of 15°C in July and August. This is the best time to visit if you want to make the most of the wonderful countryside. Fly into Shannon Airport, served daily by direct flights from a number of international destinations (including London Gatwick, Heathrow, Stansted and Edinburgh). From the airport, you can either hop on the bus or take a cab to your final stop. If you want to hire a car, which we strongly advise if you want to really get to see County Clare, we recommend you visit our online partner Rentalcars. Browse through our list of all the best places to stay in County Clare. Widen the net to include our recommendations of all the best places to stay in Galway or Limerick. Traditional country inn serving fabulous food in The Burren. Fourteen simple but stylish rooms with plenty of options for families. Charming garden for relaxation and loads of activities close by: walking, cycling, surfing...A great value base for exploring Ireland's rugged West Coast. Sights nearby - The Cliffs of Moher are just down the road or you can get a ferry to the Aran Islands from Doolin. 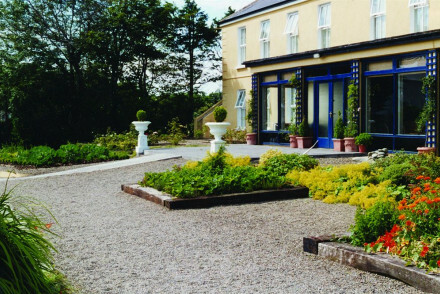 A charming family-run B&B in a spectacularly beautiful part of Ireland. Elegant rooms are decorated with soft hues, modern furniture and feature indulgent bathrooms. Enjoy the views from the sunny terrace or spend evenings in the fire lit lounge after a day exploring the region. Active Holiday - The surrounding countryside offers a host of outdoor pursuits. Sights nearby - Visit local attractions; The Cliffs of Moher, The Aran Islands, Aillwee Cave in Ballyvaughan and Doolin Cave. Great walks - Find miles of scenic trails starting straight from the property. Welcoming 18th century country house. Traditional bedroom interiors feature writing desks, sofas and modern bathrooms. Library and lounge to relax in. Excellent menu with focus on Irish seafood. A great spot to explore the coast. 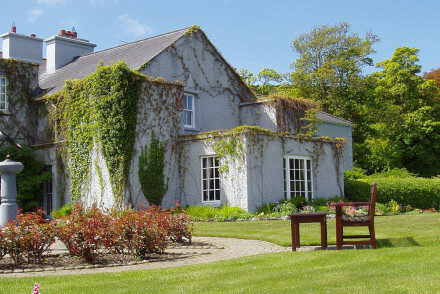 18th century manor house hotel with literary connections within a scenic national park in Western Ireland. 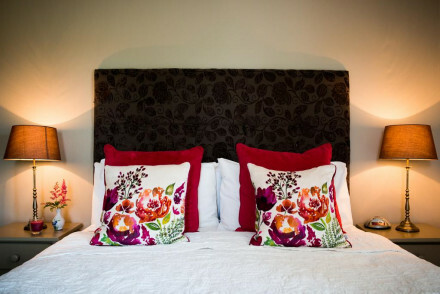 Rooms have stylish contemporary decor, views are sublime and the food is award winning. Very family friendly, some rooms even have a small private garden area, and dogs are welcome too. Child friendly - There are a selection of family rooms some with direct access to their own garden area. Foodies - 3 AA Rosette standard fine dining.